Tony Scott in the late '70s, during his Yul Brynner tonsorial period. At this point, the clarinetist had been in the jazz biz for almost four decades. He died in 2007 at age 85. Photo from "Jazz: A Photo History"
Here's another jazz player who labored long and hard in the vineyards but never received his due. 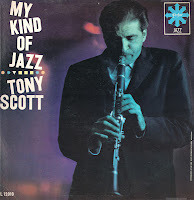 Antony Sciacca, known in music circles as Tony Scott, made numerous records with many of the jazz greats beginning way back in 1945 without ever attracting much attention. Maybe it was because he played clarinet, an instrument that belonged stylistically to an earlier generation? Dunno, but the guy's largely a footnote today. 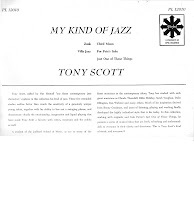 Tony Scott does, however, get credit for spreading the jazz gospel abroad. Not long after this record was made, he decamped from New York and headed off to the mysterious East. In the '60s he lived variously in Japan, Malaysia, the Philippines, Indonesia and other exotic locales in Asia. Wherever he went, he proselytized for jazz and won numerous converts for America's greatest cultural export. He also delved into zen meditation and other Eastern spiritual practices, releasing several albums having those experiences as a central theme. He was successful enough abroad that as early as 1960 Japanese jazz fans voted him best clarinetist in one of Down Beat's polls. Of course, that's an honor he'd already won in the United States four times. This recording comes to Gems via eBay – a source that I usually try to avoid because I'm much too cheap to pay their prices. But the LP went for all of ninety-nine cents, so even with the shipping it was a bargain. It was recorded in 1957 for the ultra-obscure Perfect label (the liner claims it was a division of Epic Records, itself a division of Columbia). It is notable for several reasons. RCA in addition to this one. 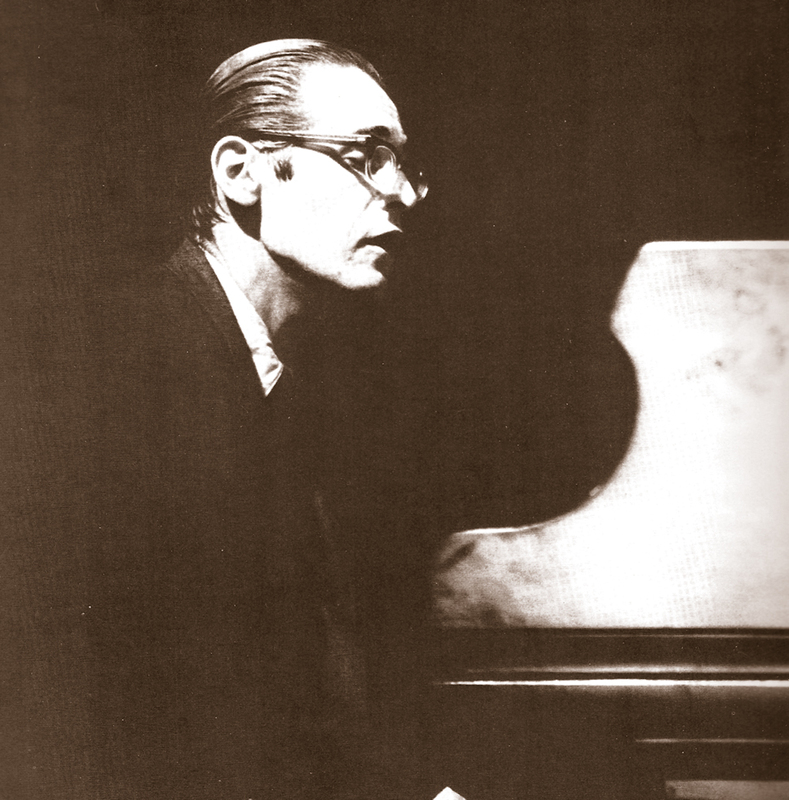 The first is the presence of pianist Bill Evans. These sessions capture Bill just months before he joined Miles Davis and emerged onto the national stage. He exhibits here many of the unusual chord voicings and unorthodox lines that later came to define his style, both with Miles and with his famous Evans-LaFaro-Motian trio. And coincidentally, Paul Motian is the drummer on these sides (or maybe not so coincidentally – Evans and Motian worked regularly in Tony Scott's groups in 1956 and '57). The other reason to grab this recording is the presence of trombonist Jimmy Knepper. One of the unheralded greats on his instrument, Knepper had just started his on-again-off-again association with Charles Mingus in 1957. On this LP he exhibits a dynamism that may have been inspired by the bassist's own aggressive approach to music and composition. 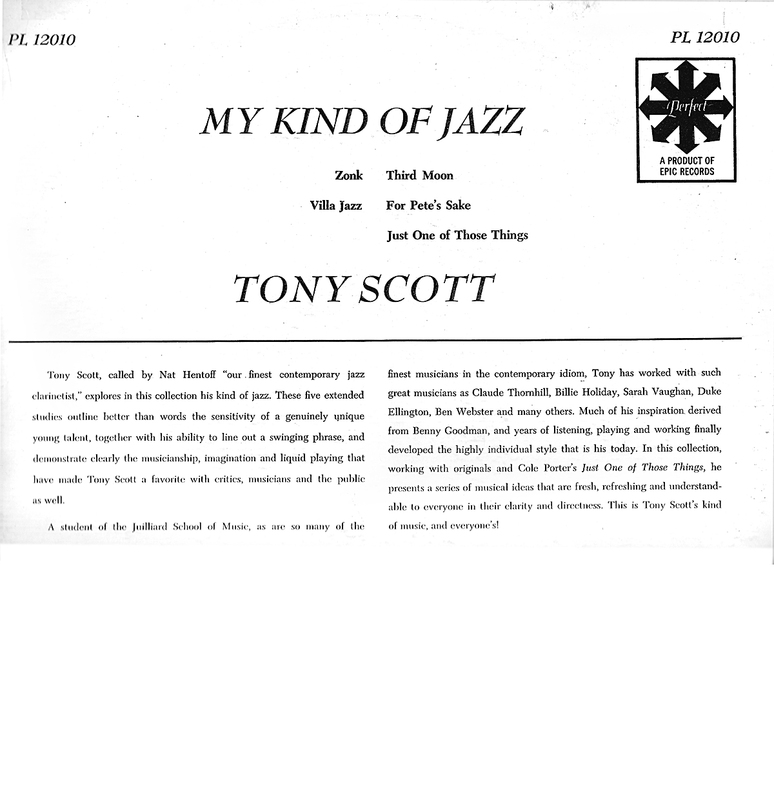 For added interest are Clark Terry on one number and baritonist Sahib Shihab on two others (all the other baritone solos are by Scott himself). And this may be legendary bassist Henry Grimes' first recording. 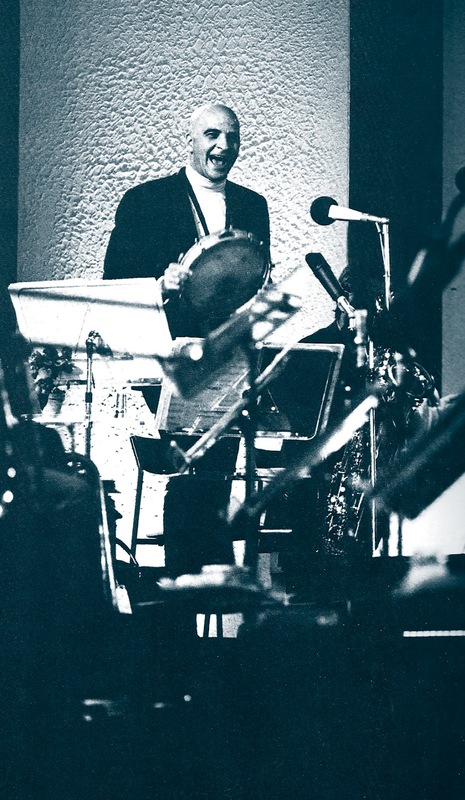 (Actually, it was Henry's third recording session, preceded by dates with Shahib Shihab and Lee Konitz – this info courtesy of Margaret Davis Grimes. Thanks, Margaret!). 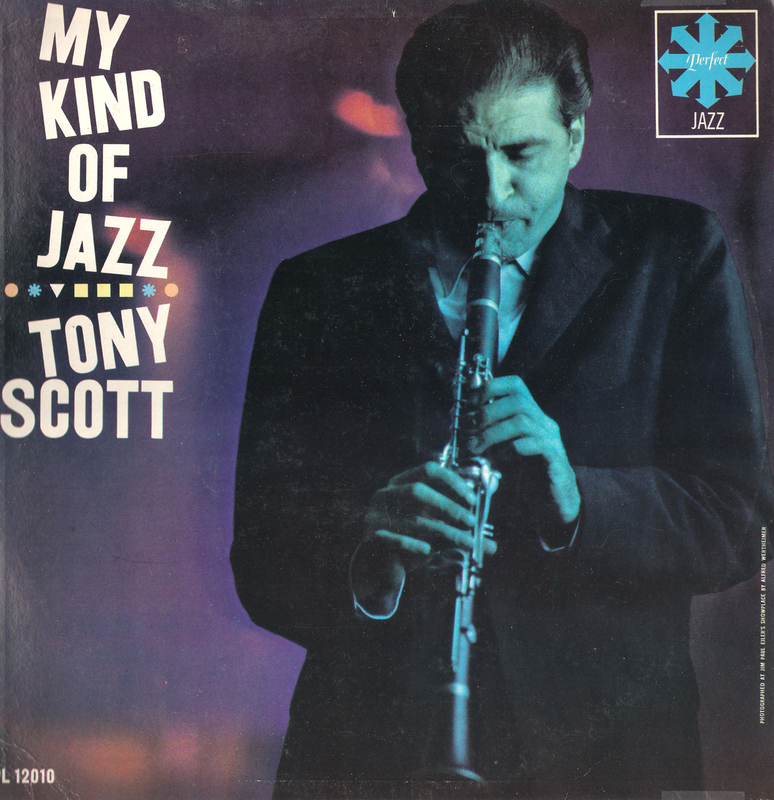 So here is Tony Scott on clarinet, with his characteristic scratchy tone and cascade of notes. All the compositions are his – with the obvious exception – and some are more than a bit quirky. You'll note that the back cover offers an incomplete listing of the tunes, but Gems has corrected it in the download. As always, these tunes were ripped from the original vinyl with only a minor tidying up of the sound. Bill Evans, p; Henry Grimes (4) or Milt Hinton, b; Paul Motian, d.
Actually, this was Henry Grimes's third recording. The first two were a Shafi Hadi-led group that was in fact a Charles Mingus group without Charles Mingus, and a Lee Konitz quintet recording. You can see Henry's discography at http://henrygrimes.com/discography, and all else about Henry at http://henrygrimes.com. Thank you! Hello, Margaret. Very nice to hear from you, and thanks for the information and link. May I assume you are Mrs. Grimes? I very much enjoyed Henry's playing. His ESP recording was on my turntable quite a lot many years ago when I was just getting into the music. Many thanks! Thank you! Yes, I am blessed to be Mrs. Grimes; Henry and I have been together for 10 joyous years now. You mustn't put him in the past tense, though; I hope you have been listening to his newer work made in this century beginning in 2003. Since then, he has played more than 500 concerts in 29 countries in North America, Europe, and the Middle and Far East. He has a dozen new recordings, some under his own name, and a new book: http://henrygrimes.com/store. He has been playing music in this decade with many great musicians: Rashied Ali, Marshall Allen, Fred Anderson, Marilyn Crispell, Andrew Cyrille, Bill Dixon, Edward “Kidd” Jordan, Roscoe Mitchell, David Murray, William Parker, Marc Ribot, Wadada Leo Smith, and again, Cecil Taylor. If you will kindly let us know where you live, we will let you know the next time Henry will be playing near you. Thanks again! Nice to meet you, Margaret. I didn't mean to imply that Henry was no longer active – I read quite a while ago that he'd begun playing again, and your who's-who list of greats he's been working with proves the point. I'll add him to the list at right, and glad to do so. I live in the Catskills but I'm in NYC nearly every week, so I suspect I'll be able to catch Henry there. Cheers! P.S. Could you please add Henry's link to the "search label" list at the right of the screen? Thanks! http://henrygrimes.com.